When the heck is the flying car going to get here? We've been promised them for years, and periodically we get to see an interesting new supposed prototype appear in the media, or as a "character" on TV or in movies. But the real, consumer-friendly flying family car never seems to actually come to market. Why is that? Well, it's a pretty tough nut to crack, and there are questions of what infrastructure would be required (if any) and of course there's also the question of whether or not we want to inflict a bunch of bad drivers onto the sky as well as the roads. I mean, if you think automated cars are a challenge, expand that to three dimensions! Yet every couple of years we see reports of whatever new and exciting flying car is just about ready to, well, take off. But you never see flying car dealerships and if you look up into the sky, you don't see any Jetson-like cars flying. It's a topic that's always been near and dear to my heart. Not only have I been a car and aviation buff for decades, I also flew light aircraft for a few years. And I would love dearly to review whatever flying car might finally make that leap skyward into the marketplace! Bring it on! The first flying car I remember was on the old Bob Cummings TV show when I was a kid. That Taylor Aerocar was ugly and unwieldy, and for all I knew it could very well have been a death trap, but it was so cool! And you can apparently buy one if you have half a million dollars burning a hole in your pocket that couldn't be spent better on a small helicopter. The next flying car I remember, other than the animated one in the Jetsons, was the flying AMC Matador in the James Bond flick The Man with the Golden Gun. Perhaps the greatest example of how flying cars remain mostly as vapourware is the Moller Skycar. It's also the coolest design I've seen and I really want to see it soar. It's a, Jetson's-like unit that exploited redundant rotary engines to ensure the required lack of plummeting. I covered the Skycar 400 for Canada's National Post newspaper back in 2003, but since then I've heard very little about it. In researching this column, I noted that, according to Moller's website, the 400 now features a new wing design and Rotapower engines, and the company has added a two-seat model that looks quite similar and just as cool. But has either one actually flown? The latest newsletters on the website, from late 2017, make no mention of the thing actually leaving the ground. The site almost seems vague on purpose, which makes me suspicious. I emailed them for an update, but have yet to hear anything back from them. Kind of makes one go "hmmm," doesn't it? Moller isn't the only company working on flying cars, of course. AeroMobile, a company out of Slovakia, is pushing its AeroMobil 5.0 VTOL (vertical take-off and landing) concept and the AeroMobil 4.0 STOL I (short take-off and landing) vehicles, which also look extremely cool. The company website says the product will hit the market in 2020, so right now it's also vapourware. Terrafugia, of Woburn, MA, is pushing a couple of models, including the Transition, which they claim will run on premium unleaded automotive gasoline, fit in a standard single-car garage, and convert between flight and drive modes in less than a minute. It's also a pretty cool concept and, like the other models covered here, isn't available for sale yet either – though they do claim they'll be on sale in 2019. So, it isn't as if no one is even trying to build a flying car. The question remains: will they ever hit the market? The idea of a family car that flies is very compelling, but there's another and possibly more sane market for such vehicles. The company SkyRunner, for example, is pushing its flying vehicle as "a Cost-Effective Complement to Traditional Airborne Policing. According to a press release I received from the company, "with helicopters and other adaptable aviation playing a vital role in supporting law enforcement throughout the U.S., airborne technology is becoming an important accessory tool for more police and fire departments. The number of public safety agencies with flying drones has more than doubled since 2016, with over 900 police, sheriff, fire and emergency agencies utilizing drones." Into this abundance of flying things comes Skyrunner's flying car, which the company says "now offer(s) an innovative accompaniment to traditional airborne policing, with many citing their cost-effectiveness and adaptability to responding in emergency situations, no matter the terrain." According to CEO, Stewart Hamel, such vehicles can be used in airborne searches by "first surveying from the skies, landing on the ground and driving to location, offering additional mobility to traditional helicopters." 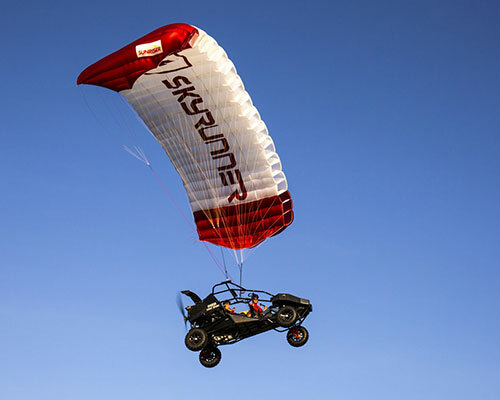 SkyRunner's vehicle, with its parachute-like airfoil, looks like a cross between an ATV and an ultralight aircraft. It also looks like it would be a blast to fly! And it can be more cost-effective for first responders to use when responding first. For example, the Mk. 3.2 retails (according to the website) for $154,000 USD. Compare that to the cost of an entry level Robinson R22 Beta II, which arguably is the closest rotary wing competitor, starts at $297,000 USD. On the other hand, a Robinson will keep you drier when it rains than the open-cockpit SkyRunner. Comparing a helicopter with an "ultralight-compatible" is anything but an apples-to-apples comparison, of course, and SkyRunner also notes that such all-terrain flying vehicles are complementary to helicopters because they can reduce operational costs significantly while also increasing mobility. Plus, "many flying cars take automotive grade fuel, a much less costly alternative to leaded aviation fuel which cost law enforcement agencies $34.9 million in 2007." Not only that but, as SkyRunner claims, the operating costs for helicopters include numerous other factors "such as helipad or airport landing fees and storage costs," which they say are "non-factors for flying cars." I hate to sound elitist, but in many ways, I'd rather see first responders zipping around in flying cars than "regular folk" who may be more prone to texting and driving and other such banes of today's driving public. And I wonder how they're going to keep these vehicles from slamming into each other and plummeting to a painful conclusion. Technology can take care of a lot of these issues (think 3D versions of self-driving cars), but the challenges are large. Still, imagine the freedom, let alone the excitement and the fun. I can't wait to try one! But I'm not holding my breath.